Having an invisible disability is difficult, especially when many of the adverse effects are delayed and we have to deal with them in isolation. Some people feel self conscious about wearing a mask, especially if we can’t find a “pretty” one that we are able to use, despite how they can reduce adverse effects. If there’s any good that comes from wearing one (in addition to protecting our health a bit) wearing a mask when we have an invisible disability helps make us visible. The type of mask we benefit most from will depend on our “sensitivities” and circumstances. Masks will filter the air we breathe in various degrees, but unless we have a full face respirator and wear a hazmat suit, our eyes and skin will still absorb chemicals that can have an adverse effect on our health and well-being. For this reason, they should not be thought of as complete protection from pollution, and are therefore best used only when absolutely necessary. Information and resources about masks that filter out some of the different types of daily pollutants we are subjected to, and what kinds of filter materials are needed to purify what kinds of pollutants follows. Not everyone tolerates all of the materials the masks and filters are made from, and some people can’t find any masks that are tolerable or easy enough to breathe through. Masks range from lightweight fabrics, sometimes with a layer of carbon felt, to full face respirators with a number of different filters added. Some of the respirators are made from materials like vinyl that will expose the wearer to continuous off-gassing and absorbtion of chemicals like phthalates. Other respirators may take a while to off-gas before being safe to wear. It’s hard to know how long it will take due to individual sensitivities and what seems like frequently changing supply chains for materials. Some masks are completely disposeable, generating a lot of waste, others are wholly or partially washable and re-usable. Some of the fabrics and dyes can be quite toxic and the chemicals may or may not come out in the wash, so something that filters out particulates could actually be adding toxic VOCs to the wearer’s air! 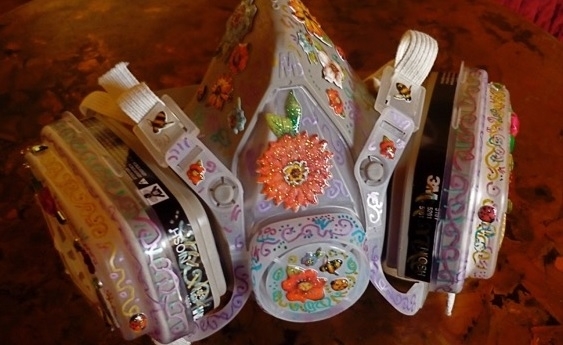 If a cloth mask isn’t enough protection, and the industrial look isn’t for you, you can always get creative and decorate the exterior of your heavy duty respirator! Phthalates are found in soft plastics like vinyl and many fragranced products. They are linked to all kinds of health harms, and have been banned from some products made for children, but a child can still be raised in a home full of phthalates, as they are used in floors, plastics, scented candles and air “fresheners”, and even in many laundry products now. Check out this research about how we absorb phthalates from simply breathing in the air where they are offgassing, we don’t even have to rub them into our skin! 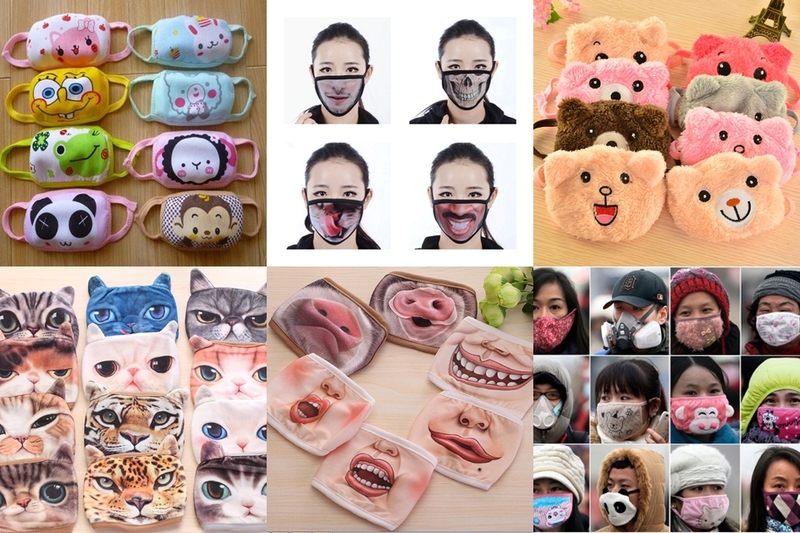 Some of the many (mostly nuisance level particulate) masks available in Asia, where people aren’t afraid to be creative or silly, despite the seriously sad need. The cost of masks and filters is an expense that polluters have externalized, and downloaded onto we the people. Ultimately, polluters should not be allowed to pollute for profit. Humans are creative. There are many ways to eliminate harmful pollutants, and until that is done, the polluters should be paying for our protective gear, and other health care costs. They should not be allowed to profit while destroying our health and lives! Polluting us for profit is! Three of the four images in the banner photo at the top of the blog are from a recent Greenpeace UK action on outdoor air pollution. We need serious regulatory and policy action to eliminate all kinds of pollution, and prevent the adverse health effects that pollution causes. Masks are just a bandaid. They are a necessary bandaid, but they are not a solution to global pollution. Be careful who you vote for. Now more than ever, it’s important to learn about the kinds of regulations and policies they support. Will they prioritize a healthy environment for all? Or will they continue to allow corporations to pollute us for profit? Do they expect us to pay for the damages when others profit while being allowed to cause harm? Do they support people with disabilities and believe in equal access? Or do they want to reduce benefits and access to safe housing? Those of us who need a mask or respirator to breathe in the “real” world are here to let the rest of the “real” world know that this kind of reality is only one possible “inevitability”, but it’s not one that we have to allow everyone to experience. It really is possible to have regulations and laws that protect our health, well-being, and the environment we depend on for life. If we keep voting for people who put industry profits ahead of lives, if we keep consuming convenience, then before long, no-one will be able to breathe on this planet, and it’s the only one we have. Show some love for life. Take action to prevent pollution, indoors and out. This entry was posted in Accessibility, Air Quality, Disability, Environmental Health, Health Care, Pollution, Products and tagged allergies, asthma, cancer, Chemicals, environment, environmental sensitivities, fragrance chemicals, hazardous air pollutants, indoor air, invisible disabilities, MCS, MCS/ES, multiple chemical sensitivities, petrochemicals, phthalates, sensitive to pollution, toxic chemicals, toxic trespass, VOCs. Bookmark the permalink. There’s no point in suffering more when we can suffer less!!! One of the people I feature later this month has made cards to hand out. Some people also carry brochures. Conversations can be a bit challenging when wearing a mask… that’s another reason why clean air is always better! What I Wear In Bad Air :: Lisa M.
What I Wear In Bad Air :: Heather D.
What I Wear In Bad Air :: K.B. What I Wear In Bad Air :: E.P.